Enhance functionality and preserve a stylish image with the Chrome Pull-Out Pantry. The 5200 CR Series is available in a plentiful selection of sizes and is designed on the ORC 450 lbs. rated slide system for a quiet glide out function. This Premiere accessory features new micro-adjustment door mounting brackets and top and bottom slide covers for a finished look. 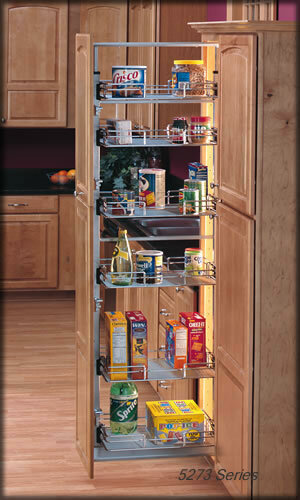 The trendy chrome pull-out pantries are kit packaged with frame, baskets and door mounting brackets in one carton. The new pantry soft closes slide mechanism revolutionizes this popular application. Designed to accommodate the heaviest loads found in today's kitchens, this superior system provides effortless opening and soft closing regardless of the load. NOTE: All pantry kits are packaged with frame, baskets, and door mounting brackets in one carton. 450# rated Full-Extension slides. ALLOW 5-6 WEEKS FOR DELIVERY.